Arrhythmias may develop in the Fontan patient soon after the procedure is performed, or much later. In general, the older the patient is when operated on, the more likely it is that conduction problems will occur. 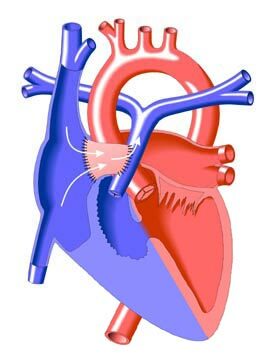 Some early forms of the Fontan procedure led to enlargement of the right atrium because it was left exposed to high systemic blood pressures. This resulted in hypertrophy, or the enlargement of the chamber, which slows conduction and promotes the development of arrhythmias. Those Fontan patients who have conduction problems generally have larger atria (both right and left) than those who don't. Arrhythmias after the Fontan are often caused by the modification of cardiac tissue during the operation and subsequent scarring. The sinoatrial node, the heart's natural pacemaker, often becomes dysfunctional as a result, which may lead to rapid beating of the atria (atrial tachycardia). Recent modifications of the Fontan, with decreased cutting of atrial tissue and less exposure of the right atrium to high systemic blood pressure, are believed to reduce the risk of post-operative arrhythmias. Treatment of post-Fontan arrhythmias may involve medications (e.g. amiodarone), the insertion of pacemakers, and radiofrequency ablations (non-surgical procedures in which the heart tissue that is causing the arrhythmia is neutralized). Re-operations are sometimes performed, in which anatomical changes are made to decrease the risk of conduction anomalies. Unfortunately, Fontan patients are often subject to recurring arrhythmias and a series of treatments is sometimes necessary.